Pan pizza stuffed with broccoli rabe tucked under a blanket of spicy sausage. 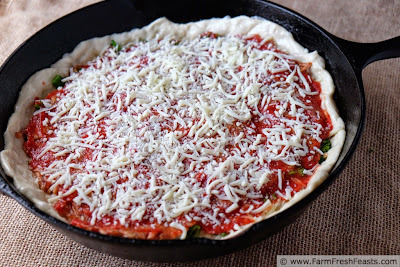 I've been making deep dish pizzas in my cast iron skillets at least one Friday Night Pizza Night a month, using whatever's fresh in the Community Supported Agriculture (CSA) farm share. Thanks to the long season of cool weather crops I feel I can still share this now--and I need a break from the holiday recipe palooza. 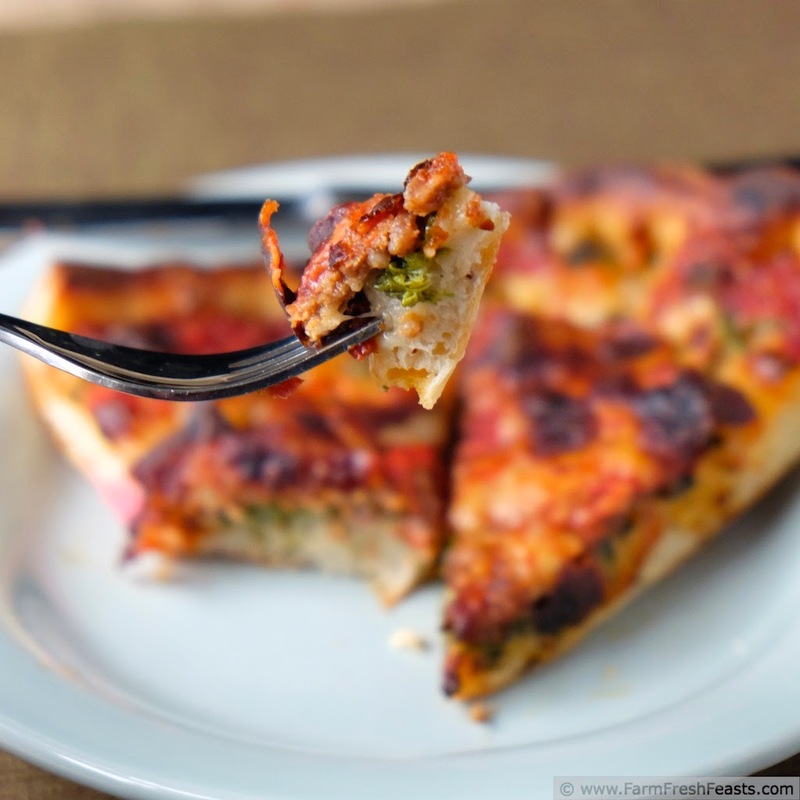 This pizza is definitely a break from Holiday Hoopla. 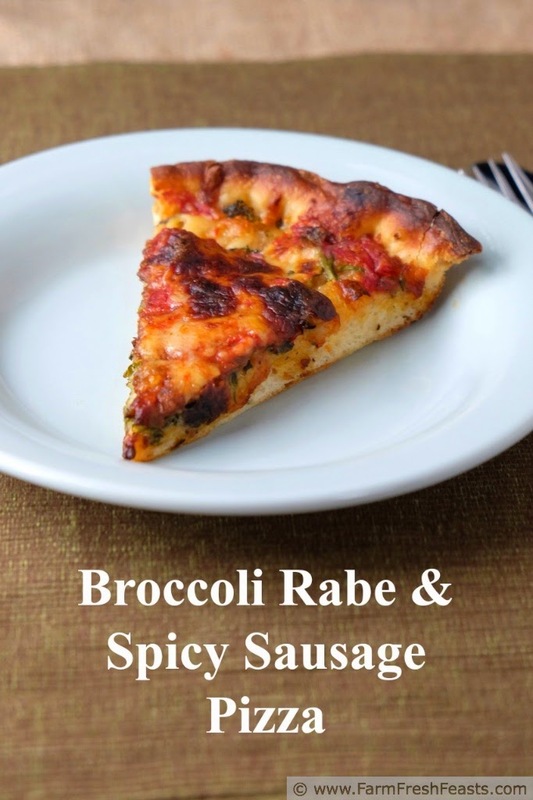 The spicy sausage kicks ya in the teeth asserts itself and the broccoli rabe manages to hold its own. If any vegetable could hold its own in a fight, those in the broccoli family sure get my backing. They do so much to make us not want to eat them! However, the Happy Caterpillars which remind me that my food has not been sprayed with pesticides sure enjoy eating them. It's not just caterpillars that hitch rides in the farm share box. A ladybug and a striped beetle came in the other day with the dill. 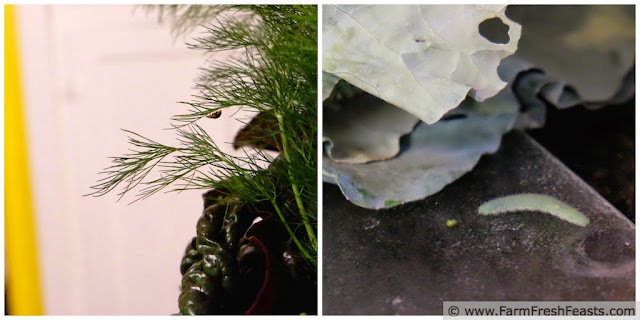 I could write a whole post on The Critters We Find In Our Farm Share but I just made a collage instead. I'm noticing that the posts I'm writing the past few Thursday nights, for publication on Fridays, are short. I'll blame it on the dog. It's like having a toddler in the house--though a toddler that you can lock in a crate when you go to bed or to the store. Hopefully I'll be spending tonight at the library for NaNoWriMo being productive. In the meantime--for more recipes using broccoli rabe, please see my Broccoli Rabe Recipe Collection. 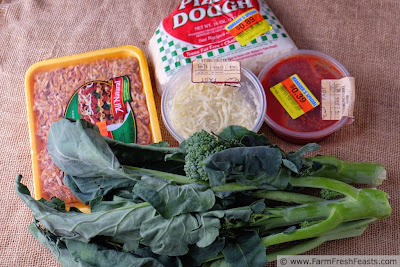 For more pizza recipes, broken down by vegetarian or meat or fruit toppings, please see my Visual Pizza Recipe Index. You can tell from my ingredient photo that I didn't get my act together and make the dough or sauce from scratch. Those magical markdown stickers caught my eye again. Even the cheese was marked down. Triple score! Preheat oven to 400 degrees Fahrenheit and if you've got a pizza stone good for you. It's not as necessary in this recipe as you're using a cast iron skillet to cook the pizza--though I don't recommend preheating the cast iron skillet. You may burn your fingers trying to poke the pizza dough into the pan, and we wouldn't want that. Preheat cast iron skillets when you're making cornbread--it's really awesome. Back to pizza. Chop the thin stems, leaves, and florets of the broccoli rabe into bite-sized pieces. In a medium skillet over medium heat with a few tablespoons of water, steam the broccoli rabe until it is bright green, about 3 to 5 minutes. Drain and set aside. 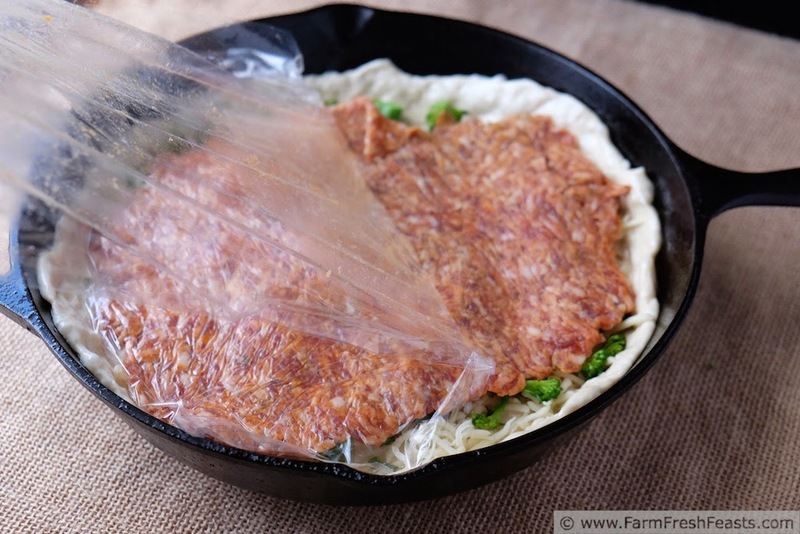 If you do sausage in your deep dish pizza, the flattened disk between plastic wrap concept is really terrific. I had a couple of failures over the weekend--I mixed up a large batch of spinach pizza dough and somehow forgot to divide each ball in half (which would have meant quartering my large batch) so I made very very doughy pizzas. More like a weirdly-shaped focaccia actually, but they tasted fine. I'm getting spinach in the last farm share of the season and will try one more time to get it right. 1. I've been craving broccoli lately. I've eaten it the past two nights and I'm going to buy more. 2. 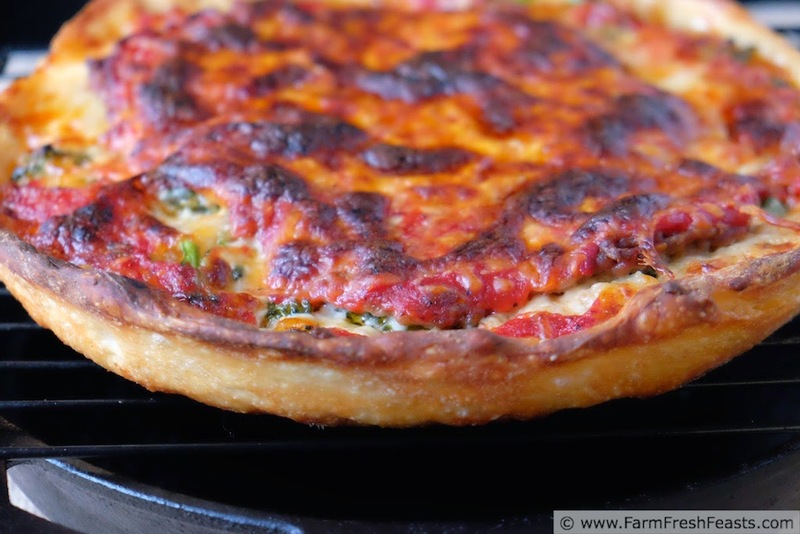 I love the deep dish cast iron skillet idea. Mark me down. I'm doing this one. For you, I worked on vegetarian deep dish pizza over the weekend. See above--not ready yet but the taste worked great. Sadly, no broccoli in it, but that's OK.
What a great recipe to try. 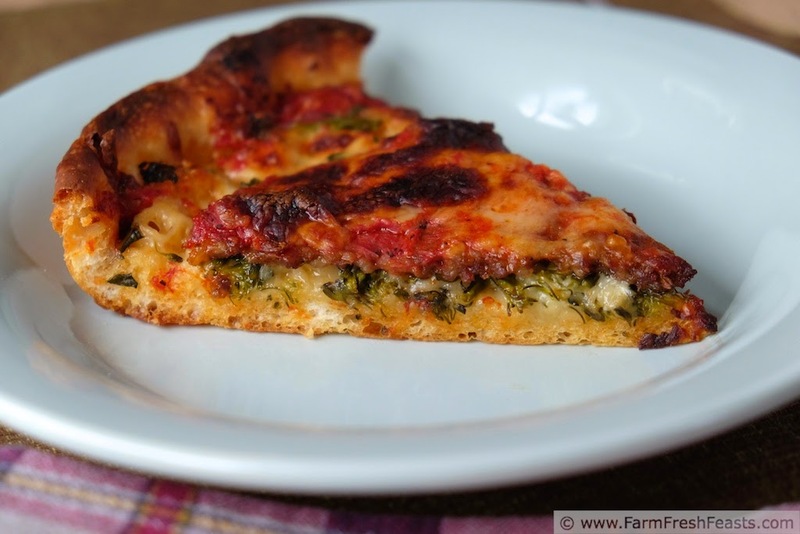 Your Broccoli Rabe and Spicy Sausage pizza looks delicious. Thanks for hosting! Looking forward to next week!